Updated from the recipe archive. While planning our July 4th party last year, we decided that another dessert was in order. And really, when is another dessert not in order? For a while I wanted to try a traditional southern dish, banana pudding. I found a recipe that was super quick, got great reviews and seemed easy to modify. Judging from the response, this recipe is not only a keeper, but a new tradition – the entire bowl of pudding was gone within 10 minutes. To our surprise it went even faster than the immensely popular raspberry brownie. This pudding is so good, that I’ve made it at least 15 times this past year. 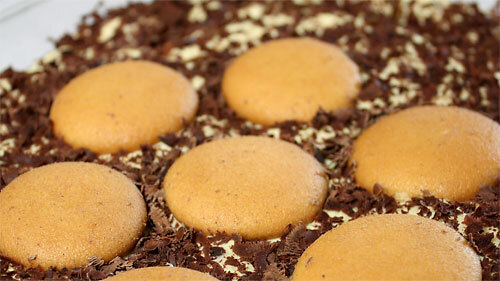 After a few hours in the fridge the vanilla wafers begin to soften and absorb the pudding like a sponge. Even after several days when the wafers have completely softened, they are still just as delicious and add the perfect depth to this simple dish. And since this dessert is nearly guiltless I guarantee you’ll soon be eating leftovers for breakfast like me. 1. In a large bowl whisk together the greek yogurt, peanut butter, whipped topping and milk until no clumps remain. Stir in the instant pudding until well incorporated and mixture begins to thicken. 2. In a large glass serving dish or trifle bowl, form a layer of vanilla wafers, flat side facing up. Cover with a thin layer of pudding, followed by a layer of banana slices. Add another thin layer of pudding and repeat. Or get creative by pudding (hah!) some wafers against the wall before adding the next layer of pudding for a nice presentation. Top with a few vanilla wafers and garnish with shaved chocolate and/or fresh berries. Refrigerate for at least 2 hours before serving. As Nick said, this was a huge hit on the 4th.The bowl was clean in 10 minutes.The second time the three of us finished it in 3 days and we don’t really eat dessert! Irresistable! The fat-free ingredients make it almost guilt-less. One tip for ease in making is to allow the whipped cream to defrost completely and when mixing together, use a wisk. With all the summer fruit options, it’s fun to decorate the top.This whole recipe went together very fast. I actually have a huge love for vanilla Jell-O Pudding too. But I never buy it because its processed… what I need to do is find a recipe and make my own vanilla pudding, I think. Because that stuff is SO delicious! That banana pudding looks good! What an easy way to get a gorgeous looking dessert. I love that delicious doesn’t require hours of work. I’ve seen an off-brand banana cream pudding at Wal Mart. It tasted fine to me, but I would much prefer homemade pudding. Period. And you definitely need to make one with peanut butter! Grace, It’s quite amazing what good food can do to people! VeggieGirl, Now the only problem with it is that it’s not vegan right? Because of the pudding mix? Are there any good pudding subs out there? Sagan, I think homemade pudding is fairly easy. I believe it is egg yolks that thicken it, you need to cook it on low heat stirring constantly so the eggs don’t actually “cook” and turn to scrambled pudding. Lyn, Daphne, Thanks for reminding me about the peanut butter! I’ve added the suggestion to the recipe. Giz, Dee, I agree! It’s a quick dessert which can be dressed up easily for a nice presentation. It’s so good, I’ve already had friends ask me for the recipe. Carla, I agree, homemade is always better, but I don’t know how that would come to play in this recipe because the only thing added here is the powder, but traditional pudding is already made with egg yolks and such. Considering the recipe calls for 2 packages of pudding mix, perhaps I’ll just make a half batch for myself and add some peanut butter in! i’m only on this post to remind you of how my brain is asking and licking crumbs off my finger from the peanut butter bread. okay.. i had to say that..
Nicely done. I love the simplicity of the whole thing, and can “taste” how great this dessert is going to be. AND I’m going to add the prerequisite “peanut butter” as well……. Looks gorgeous! I’m bookmarking this! hello again, you beautiful bowl of pudding, you. this continues to be, and will ALWAYS be, an amazing creation. Why thank you maam =). I’ll be making this on Friday for out of town company. Can’t go wrong with banana pudding and we’ll see what they say about adding the PB to it. I know I’ll be liking it. :) p.s. Love the pun too! Oh, it’s superb. I have yet to find someone that doesn’t love this. Let me know how it goes! Wow, this looks absolutely amazing!!! Faster than the raspberry brownies? This must be the bomb! Awesome treat for breakfast!! Yea, we were incredibly surprised but we wound up making a new batch for ourselves the following day. It’s just that good. Boy oh boy, does this look fabulous! It’s dangerous for me to be reading this around 1am. You see, now I have a craving that needs to be satisfied, but it’s 1am… I can see this treat in my near future (read: tomorrow morning)! Perhaps…maybe I should call it northern-style banana pudding. Wow Nick! for a dessert this isincreadibly healthy! I’m loving it! I’m also a big fan of the softened wafers… oh when you can just spoon them out… heaven! This is a recipe after my own heart. I need to make this for my babies! This banana pudding is the best ever! I love the Greek yogurt and the peanut butter. And you mix everything in one bowl so there’s no mess to deal with. Couldn’t ask for a better dessert (or breakfast!). I haven’t had this anywhere but in LA with my grandmother.. She makes it almost exactly like this, but sprinkles something on top, and I can’t remember what! Maybe chocolate shavings? I think that is just her personal touch. But this recipe is to DIE for, it’s great for potlucks too. Perfect for the potlucks! So good in fact, that when I go to potlucks now it’s expected of me to bring it. I don’t get to try new dishes but I don’t mind since the pudding is so good! My favorite! I was looking for something a little different from just the normal banana pudding, and the twist on this one is awesome. My grandma always made this for me growing up, sans the shaved chocolate. We are making this for a baby shower this weekend, YUM! Kudos for the recipe. Hah, you confused me for a second =]. Another Review & a PB Banana Pudding Recipe « WE'RE TOTALLY NUTS!